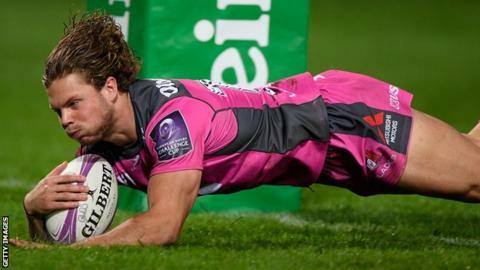 Gloucester powered to a bonus-point victory over French side Agen in the European Challenge Cup. The hosts ran in three tries in the opening 21 minutes through Ben Vellacott, Billy Burns and Ben Morgan, and Tom Savage also went over. Gloucester, who lost their opening game at Pau last week, stretched their lead through Henry Purdy and Owen Williams. Vellacott, Richard Hibbard and Jake Polledri completed the rout, with Branden Holder scoring Agen's only try. Gloucester, beaten finalists last season, now have six points from two matches after securing a losing bonus point in south-west France. Coach Johan Ackermann made nine changes from the defeat by Pau, and it paid dividends as Vellacott dived into the corner after only five minutes of his first start for Gloucester. The hosts were dominant in the opening 40 minutes and led 28-9 at half-time, with England number eight Morgan going over from close range in first game back since injuring his calf against Exeter on 1 September. In the second half, Williams scored his first try for the club and Vellacott grabbed a second as Gloucester secured a comprehensive victory.